At Gallery, we believe that giving is something that comes from an overflow of our hearts. We give because God has given so much to us, and we want to be faithful stewards of those blessings. We do not pass an offering plate during our gatherings. Our church believes that as an act of obedience to God, you come knowing what you are to give. Knowing you are being obedient allows it to be a joy to give. We have wooden boxes in each of our Gatherings for you to leave your offerings, prayers, and any other questions you may have. 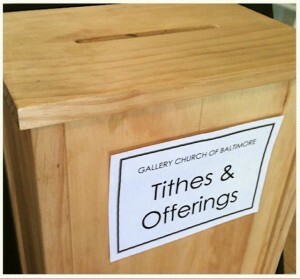 For most banks, all you have to do is add the church into your bill pay system by adding the church name (Gallery Church Patterson Park) and the mailing address (3115 Eastern Ave, Baltimore, MD 21224). After you have created the “bill” you can then determine how much you want to pay and how often you want a check mailed. Most banks have instructions in their help section of their online banking page.